This year my boyfriend set down some ‘rules’ for our Christmas presents, designed I think to turn Christmas shopping into a sort of ‘Challenge Anneka’ type experience only without the skin-tight jumpsuit (hooray) or giant truck (boo). The rules included a second hand item, something made by you, a gift costing less than £10 and something consumable. The something consumable he got was a box of Maltesers but I definitely had the better end of the deal with the very exciting prospect of a day’s baking course at Angela Gray’s Cookery School based at Llanerch Vineyard. Re-discover the art of baking. Learn new skills, and how to add variety to your culinary repertoire. It’s the perfect way to spend the day, and you take home delicious eats to share with friends. Make Carrot and sultana scones with cheese pate, Fougasse and Pissaladiere. Break for a well deserved lunch of Leek rarebit tart and winter salad and finish with Spiced chocolate brownies. We all know that baking is having a bit of a moment with the Great British Bake Off having revived interest and being a bit of a sucker for a bandwagon I was keen to expand my own baking beyond your basic cakes and tarts. The school itself is house in the grounds of Llanerch Vineyard which has seen some major improvements since it was sold in 2010, one of these being the cookery school which opened in April 2011. It is housed in a separate building with a fully equipped kitchen area that has about 6 or so workstations, there is also a large farmhouse style table with an Aga next to it and although it was a cold January day when we were there, the kitchen has doors around 2 walls which looked like they could open right round when the weather allows. The whole area is finished to a high standard and is immaculate; in fact it all screams QUALITY at you. I arrived just before 10.00am to find Angela and one other student already there. Since it was the first course back after Christmas there were only 3 of us booked on and one didn’t turn up, so it was just the two of us. 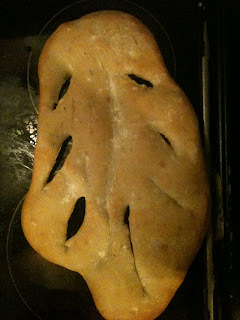 After coffee and chocolate cherry tart we were ready to start and first up was a basic bread dough which could then be turned into Pissaladiere and Fougasse. Bread is one of the areas I have very little experience with so most of this was new to me. Angela took us through the basic dough recipe and taught us to knead the dough by slapping it against the worksurface (tres therapeutic) This was then placed into the oven on a setting specifically for rising dough (fancy!). 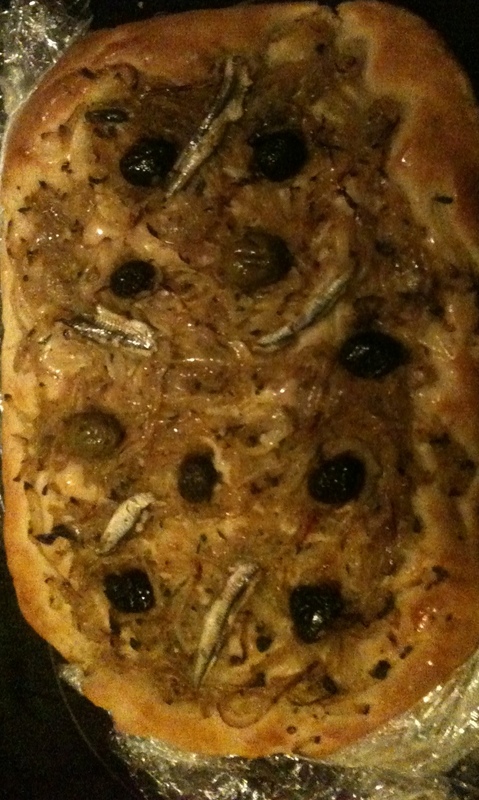 Next on the list was the onion topping for the Pissaladiere which we were reliably informed, is a pizza style style dish of Southern France which is usually served in small slices with an aperitif. The usual topping (which we were making) is slowly cooked onions with garlic, olives and anchovies but Angela also suggested roasted peppers, sausage, cheese etc. We then made a start on the scones, the addition of carrot being a new experience for me. We prepped the mix and left it to one side to return to the dough which by now had doubled in size. It needed to be knocked back and then it was ready for use. Half the dough was flattened for the Pissalaldiere and the onion mixture was spread out across the top, and dotted with olives and anchovies. Then it was time to prep lunch which was a leek rarebit tart. Tart tins were lined with mustard and parmesan pastry, leeks sautéed in butter and added to a strong rarebit mixture. A large salad with a pomegranate molasses dressing was prepared, and we sat around the large farmhouse style table for lunch and a good chat. The final items to be made were the brownies and these were flavoured with cinnamon and my favourite spice, cardamom. I thoroughly enjoyed my day at Angela’s cookery school and the new skills for me were all about the bread making. Angela is absolutely lovely. Friendly, chatty and encouraging, no question was too stupid and nothing too much trouble. The quality of the equipment and the ingredients is all very good and the school seems to fit in well with the wider work happening on the site. Whichever way I look at it £140 is quite a lot of money so if when I go again and have to fork out for it myself, it will either be for something a bit more technical (I really fancy the knife skills session) where I can really pick up some new skills, or for one of the taster courses which are a more affordable £50. Judging by the website I don’t think they are having much difficulty attracting customers with some upcoming courses already fully booked. I also hear that a certain red jerseyed rugby team are booked in for a session soon. There are more courses and some events (including a glamping day) planned for this year and the school is a great addition to an improving food scene in South Wales. I look forward to being able to visit again. Angela Gray’s Cookery School is based at Llanerch Vineyard and offers a range of cookery courses and events including 2 day schools, demonstrations and a Lunch Club.